For the first time solrico was Section Author for the recently launched Renewable Global Status Report (GSR) published by the Network REN21. 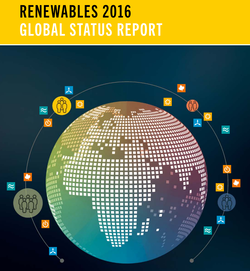 GSR gives a timely and comprehensive overview of the status, recent developments and trends in all renewable energy sectors. Solrico drafted the chapter Market and Industry Trends – Solar Thermal Heating and Cooling see page 70 and 74 in the full report (download link). In close cooperation with the authors of the international study Solar Heat Worldwide from the Austrian Institute AEE INTEC solrico gathered the key global and national market figures and identified specific trends in market, industry and research. 40 GWth was newly installed in 2015, of which 76 % was added in China. “2015 saw increasing interest in and deployment of large-scale solar thermal systems in district heating networks and for industrial use. Large investments signaled a new era with the start of the construction of a 1 GWth solar process heat plant in Oman,” so the key findings of the GSR. REN 21 promoted the launch of the GSR2016 with a big marketing campaign including press releases in 11 languages, with several webinars, and press events in San Francisco, Manila, Stockholm, Brussels, Munich and Beijing during June this months. Obviously the news are dominated by renewable electricity again – record year in added capacity in PV (50 GW) and wind (63 GW) and increased investment in renewables (USD 286 billion worldwide). But the message was also spread out that “there is far less policy focus on transport and particularly, heating and cooling, so these sectors are progressing much more slowly”, reads the press release from REN21 Secretariat.